When I am asked about the UHS travel club, I often say that my participation changed my life. That initially seems cliché, but with a closer look, it’s very clear that without Travel Club, I very well might not have been introduced to what I love to do and what I love to learn about. Travel Club has ignited and continues to foster the enthusiasm I have for history, for art, and for engaging with other cultures in such a prevalent way that I am pursuing studies in the same realms, and am most definitely planning on studying abroad when I am in college. What our trips have provided through the opportunities to view and discuss art and architecture, the memories of bus karaoke and walking tours and lake cruises, the bonds created with some of my closest friends, and the reminders that what we learn about in the classroom is still relevant in the world around us is truly unparalleled. I will always remember our trips fondly and with great gratitude to those who are willing to spend the time to make it all happen. I have been on three UHS Travel Club trips so far: twice to Europe, and once to NYC. The experience that Travel Club provided has never failed to leave me rushing to sign up for the next trip, and I am more than glad that I will be able to bring my high school experience to a close with a final adventure after my senior year. Marina Martinez (Europe 2016, NYC 2017, Europe 2017, Europe 2018). Marina will be attending college in Europe at the University of Edinburgh starting fall 2018.
anyone interested to join the Travel Club and have an experience of a lifetime. In the summer of 2017, I was given the incredible opportunity to travel to England, Ireland, Wales and Paris with the UHS Travel Club. Before departing for the twelve-day trip, I knew I would really enjoy spending time in these beautiful and historical places with my best friends, but I had no idea how much it would impact my perspective on the world as a whole. Between crying in the National Gallery in London at the Arnolfini Portrait, and the late night dinners we spent in the heart of downtown Dublin, I came to realize how diverse and wonderful the world is. Travel Club changed my life and I have Ms. Sheets and Ms. Tully to thank for helping me discover my love for art, history and adventure. I attended the New York Art History trip in the spring of 2017 and it was truly one of the greatest experiences of my life. The Travel Club program does an amazing job of making sure that you have many things to do while you traveling but the tour still provides you with lots of free time to explore the area you are in. The NYC Art History trip was honestly amazing. Seeing the art was amazing, and so was being in New York City. The teachers do a great job of keeping you save while still keeping the trip fun and lighthearted. I would recommend to anyone that they should go on any of the available Travel Club trips – they really are a once in a lifetime opportunity! You will have an amazing time with your friends and your teachers, and it was a fantastic trip for me! My NYC Art History trip was one of the most amazing experiences I have ever had. I’d never been to the East Coast before, and I had never seen the Atlantic Ocean. The city was overwhelmingly full of life, in a good way of course, and it’s exactly what you expect NYC to be like. Being able to see some of my favorite and some of the most iconic pieces of art in person was life changing. I cried in the middle of the Guggenheim at my first glance of Van Gogh’s Mountains at St. Remy. Being in front of such breathtaking art in the middle of one of the most important cities for art in the world was like nothing I’d ever felt. It made every piece feel more real and I felt irreversibly connected with each artist and their work. I wouldn’t trade my trip with Travel Club for anything. I got closer to friends and teachers, all while gaining an even greater appreciation of art and the history of our country that developed in one of the world’s greatest cities. 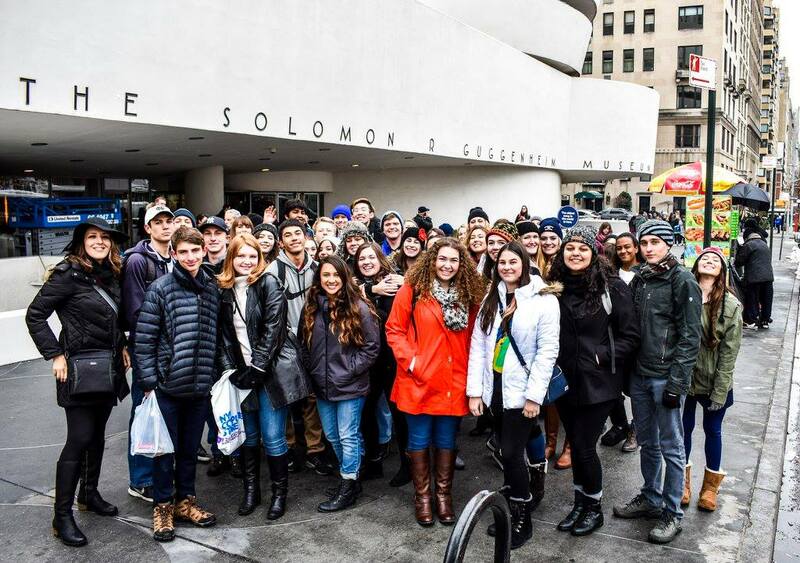 This past spring break, I traveled to NYC with the UHS Travel Club. My passion for art began that same year in MS. Sheets AP Art History class. While in New York, we visited the MET and the Guggenheim, museums that contain some of the world’s most influential artworks. Seeing the works we had learned about in real life made the experience even more special. Instead of merely viewing the art, we were able to connect with it as we were aware of where it came from and why it was created. This trip also encouraged me to pursue Art History in my future as I got the chance to talk one on one with a Guggenheim education curator who inspired my dream to one day volunteer at the MET. This trip also began my love for NYC and its diverse and vibrant culture. Previous to this trip, I had never been to the East Coast, making any college on that side of the country immediately fall off my radar. However, I now plan on applying to NYU and hopefully I will attend there next fall. I would have never considered this option had I not embarked on the adventure with Travel Club. Because of the NYC 2017 Travel Club trip, my future will be forever changed. 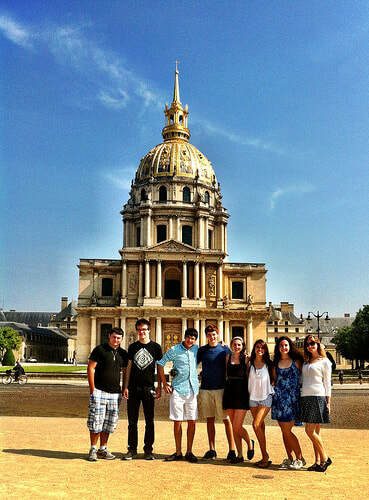 We participated in the inaugural Travel Club trip to London, Paris, Florence, and Rome in the summer of 2013. Though we were about to be seniors, we didn’t know each other very well before the trip. However, we quickly became friends while laughing along to Monty Python, eating crepes at Versailles, wandering the streets of Florence eating delicious pizza, and taking goofy pictures of each other at the Colosseum (and pretty much everywhere else). This trip sparked the love of travel for both of us. Brooke recently completed her first solo trip to Northern Europe and Natalie spent a semester abroad in Northern Ireland. This trip with Travel Club is one of Natalie’s favorite memories from high school and partially inspired her to choose International Studies as her undergraduate major, and now master’s degree. By now we have both finished our undergraduate degrees and are living in the San Francisco Bay Area. Our love for travel is still very much alive, as is our friendship which was formed out of this trip. A trip with Travel Club was a great way for us to not only make new friends, but to see and explore new parts of the world with those friends. Amanda went on two UHS Travel Club trips - the Europe (Spain-France-Italy) trip in 2015 and the NY Art trip in 2017. The experience was overwhelmingly positive both for her as a student and for me as a parent. The Travel Club provided a TON of information via handouts, emails, the web site, and parent meetings. We were fully prepared for the trip, long before it started. Amanda was able to go places and see more things on a single trip that you will likely never be able to do on your own. The price of the trip is worth it many times over. She has told me one of her dearest memories from high school was being in a vineyard in Tuscany, surrounded by her best friends while dancing and eating the best Italian food she's ever had, in the most beautiful place she's ever been. And all the pictures were amazing - she took over 2000 on the Europe trip. 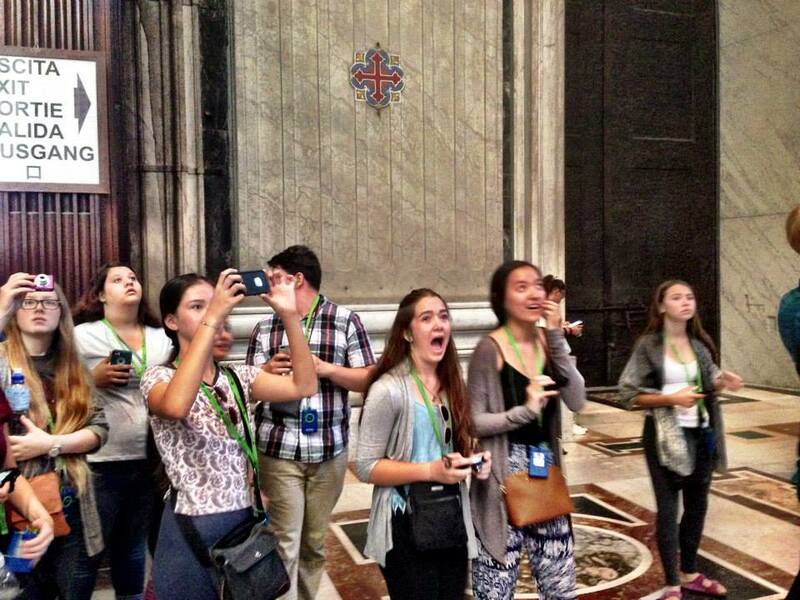 Ms Sheets captured a wonderful moment for me of Amanda's reaction when she entered the Sistine Chapel. I am thrilled she was able to see one of the most important works of art in the world and be so affected by it. The NY trip was the highlight of Amanda's senior year at UHS. Her favorite memory was seeing the art works she had learned about for so long in person. I can't recommend these trips enough! What parent is crazy enough to send their 16 year old daughter on an overseas trip without them? Well, this parent! My daughter had the privilege of traveling with the U.H.S. Travel Club to Ireland, Wales, England, and France the summer of 2017. Like many parents I was nervous and apprehensive about letting her go. However, from the day we started considering this adventure, I knew she would be in safe hands with the team from U.H.S. First, this wasn’t just any trip. U.H.S. trips are planned by a professional company that has been in business for over 50 years. They know what they are doing. Next, Ms. Tully and team are extremely organized. Students are required to attend club meetings and to present information about what they will be seeing on their trip. The camaraderie of students is built during these meetings so that when students actually do travel they have already established relationships with their peers. During the actual trip students are assigned to a teacher chaperone. My daughter was part of “Team Schmidt”. His job was to keep his team safe. As a parent I was highly impressed with his nightly check-ins and with his strict procedure for riding Paris subways! Finally, students are held to a strict code of conduct which allows for a successful trip and a school memory they will forever cherish. I am grateful for the U.H.S. Travel Club for giving my daughter this opportunity. On a side note I am saddened to say that during this trip there was a terrorist attack in London at the specific spot my daughter was to be touring in just two days time. The tour was in Wales during the attack and completely safe. While a bit concerned because she wasn’t with me, I honestly knew she was in good hands. I knew that Ms. Tully and E.F. Tours would come up with a safe alternative for the remainder of the tour. Parent communication was at the forefront during this time and we were informed that the tour would continue to London with significant safety modifications to the tour activities there. I appreciate the alternative activities that allowed students to continue to London with student safety always coming first.